It is set place in the fantasy world of Valley Doom and Eunomia created by the two brothers Marius and Peter Danielsen. The band invited several guests to help tell the story of Eunomia. With musicians such as Alessandro Conti from Luca Turilli's Rhapsody and Twilight Force, Henning Basse from Firewind and Victor Smolski (Almanac, ex Rage), they have created an epic and cinematic concept album. The full cast is found in the attached pdf. 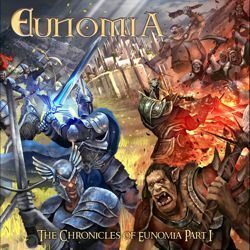 “Chronicles Of Eunomia Part 1” was produced by the Danielsen brothers in Ålesund, Norway.